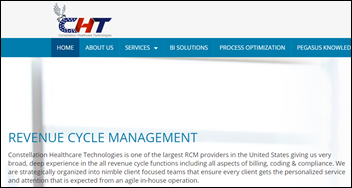 Houston-based RCM outsourcer Constellation Healthcare Technologies files Chapter 11 bankruptcy and will sell the business due to the servicing costs of the extensive debt it took on to fund its acquisition strategy. The company says it fired unnamed executives who intentionally misstated its revenue and earnings. A lawsuit filed in late 2016 claimed that CEO Paul Parmar masterminded a series of fraudulent acquisitions to allow him to falsify revenue numbers while misappropriating cash. A private investment firm owned by former Blackstone executive Chinh Chu bought the company for $309 million in early 2017. From Stern Countenance: “Re: Tronc. Mike Ferro is out as chairman following allegations of inappropriate sexual behavior. Justin Dearborn, one of his cronies from his Merge Healthcare days, will replace him. Ferro was already a jillionaire with the sale of Merge Healthcare to IBM plus he was rich before he joined Tronc. Ferro gets a $15 million consulting contract as a farewell gift. Now Justin gets to be a jillionaire, too. These guys are no dummies when it comes to money, including running Merge into the ground by slashing and burning to make numbers that looked good enough to get IBM to buy the company.” There’s another healthcare connection – Tronc (the former Tribune Publishing) is selling the Los Angeles Times to NantHealth’s Patrick Soon-Shiong for $500 million in cash. I interviewed Justin Dearborn in early 2014; IBM bought Merge Healthcare for $1 billion in mid-2015 to expand its Watson offerings. From Obsidian: “Re: HLTH conference. Between JPMorgan and HIMSS I’ve seen 100+ billboards and ads for this new conference that’s supposed to be the greatest thing since sliced bread. What do you and your readers know about it?” The conference, taglined as “The Future of Healthcare,” will be held in Las Vegas May 6-9. They expect 2,000 attendees and will offer a smallish exhibit hall. The guy in charge is money guy and conference organizer Jon Weiner, who has zero healthcare experience in advocating for “disruptive innovation.” He has raised $5 million in funding to launch the conference. Among HLTH’s handful of sponsors are Change Healthcare, Optum, and UPMC. The massive roster of 250+ presenters includes the CEOs of Allscripts, Geisinger, 23andMe, Optum Health, Change Healthcare, Sharecare, Intermountain Healthcare, and Athenahealth. HIMSS (and its newly acquired Health 2.0) seems to have most of the bases well covered and JPMorgan is where the money guys and CEOs hang out, so I’m not quite sure how HLTH will convince people to spend another $1,850 registration fee and four days away from work to go back to Las Vegas (assuming most of its attendees will have just returned from HIMSS18). However, I shouldn’t underestimate the willingness of healthcare people to spend their employers’ money on conferences with questionable ROI to anyone except the attendee, who gains validation for getting his or her employer to foot the bill. Readers: are you going, and if so, what’s the draw beyond the HIMSS and JPM conferences? I get excited by two Northern Hemisphere calendar days – the winter solstice on December 21 (after which daylight lasts longer every day through the summer solstice on June 21) and the spring solstice equinox (thanks for the correction) Wednesday, which is when spring officially begins. Actually I should add a third celebrated date that I call the HIMSS solstice, the last day of the HIMSS conference in which the crazy-busy health IT period that starts January 2 ends, replaced by a relatively lazy summer that lasts until Labor Day. April 5 (Thursday) 1:00 ET. “Succeeding in Value-Based Care Via a Technology-Driven Approach.” Sponsor: Health Fidelity. Presenters: Adele L. Towers, MD, MPH, senior clinical advisor, UPMC Technology Development Center; Adam Gronsky, director of advisory services, Health Fidelity. Success in value-based care requires a thorough understanding of how risk-based payment models work. To prosper in this data-laden era of care, providers need to manage their patient populations holistically rather than through a collection of individual episodes and be able to accurately identify, document, and report risk scores. Given the stakes, is your provider organization adequately set up to take on and succeed in managing risk? In this webinar, learn how technology-enabled risk capture optimization is helping providers succeed in risk-based payment models. Previous webinars are on our YouTube channel. Contact Lorre for information. Parachute Health, which offers a durable medical equipment ordering system, raises $5.5 million in a seed funding round. Orlando Health extends its Affinity RCM contract with Harris Healthcare for three years with an additional one-year option. Piedmont Healthcare (GA) expands its use of Glytec’s EGlycemic Management System to all of its acute care facilities. Partners HealthCare expands its use Kyruus ProviderMatch patient access solutions. University of Maryland School of Dentistry will implement DrFirst’s mobility suite to help dentist prescribers meet the state’s July 1, 2018 prescription drug monitoring program mandate. Lawrence General Hospital (MA) will implement Meditech’s Expanse EHR. Change Healthcare hires Fredrik Eliasson (CSX) as EVP/CFO. UPMC Chief Innovation Officer Rasu Shrestha, MD, MBA will lead the VA’s API project that was announced at HIMSS18. The VA’s Lighthouse project involves standards-based data exchange via an open API framework. Organizations that have signed its Open API Pledge are UPMC, BIDMC, Partners HealthCare, Mayo Clinic, Cleveland Clinic, Fairview, Geisinger, Intermountain Healthcare, Jefferson, Rush, and VCU Health. Steve Weichhand (Avaap) joins Divurgent as VP of professional services. Charles Tuchinda, MD, MBA is promoted to the newly created role of EVP and deputy group head of Hearst Health and VP of Hearst. He will also continue in his role as president of Hearst-owned First Databank. Diameter Health gives its clinical data management users the ability to track user-defined patient populations over time, with a sample use case being a health plan that wants to update its patient list with fresh HIE information on a specific schedule. Healthcare sharing ministry Medi-Share will use payment processing systems from Liquid Payments. This is interesting mostly because of the business model of Medi-Share, which is run as a ministry but is effectively an insurer since its 375,000 members agree to share their healthcare bills that are discounted via Medi-Share PPO provider agreements. Faith-based plans, which don’t guarantee that they will cover medical bills and sometimes exclude preexisting conditions, require a pastor’s recommendation and the member’s pledge to avoid using drugs, smoking, and behaving immorally. The plans are not regulated. Clinical Architecture releases Symedical on FHIR, a RESTful API based on the FHIR Terminology Service standard. The VA’s Cerner project will cost $16 billion instead of the previously hinted $10 billion, according to comments made in a House Appropriations Committee by Rep. Debbie Wasserman-Schultz (D-FL). Cerner will get $10 billion (which is probably where the earlier figure originated), the VA will spend $4.6 billion on infrastructure improvements, and another $1.2 billion will be budgeted for third-party project management (Booz Allen Hamilton has already been awarded $750 million of that). 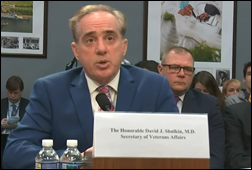 Another tidbit dropped in a House Committee on Veterans’ Affairs hearing: VA Secretary David Shulkin had planned to announce during his HIMSS keynote that the VA’s contract with Cerner had been finalized, although continuing delays took that topic off the table. HHS should cite providers for data blocking if they don’t provide patients with an electronic copy of their EHR information within 24 hours of their request. The Center for Medicare and Medicaid Innovation should create a uniform patient data portal for storing and sharing patient information. HHS should expand its Sync for Science program in which patients can contribute their medical records to research. 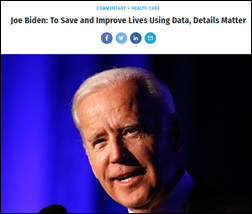 The National Cancer Institute should create a cancer data trust to hold EHR, diagnostic, genomic, and outcomes data. The New York Times reviews the NIH’s $1.4 billion project to collect genomic, medical records, blood, and wearables information from one million Americans. The “All of Us” research program – still in beta testing — hopes to uncover new diagnostic and treatment insights, but hasn’t made much progress in its first three years even though its 2017 budget alone was $230 million. Geisinger gave back its $50 million participation grant because endless meetings and conference calls weren’t going anywhere, while Kaiser Permanente felt NIH just wanted its data without its insights so it passed, too. Both organizations are creating similar systems and so is the VA, which is making good progress for a budget of just $250 million over seven years. Researchers also say it’s hard because patient information is scattered across multiple provider EHRs and the US doesn’t have enough DNA sequencing machines to handle the load. The US News “top medical schools” for research are Harvard, Johns Hopkins, and NYU, while the top three for primary care are UNC-Chapel Hill, UCSF, and University of Washington. Epidemiologists are being robbed of their ability to track infectious disease activity by the shutdown of US local newspapers, which provide higher-quality information than social media. Aprima will exhibit at the Association of Independent Medical Software Value Added Resellers Annual Conference March 23-24 in San Antonio. CoverMyMeds will host TechPint March 22 in Cleveland. Healthwise will exhibit at the 2018 Midwest ACE User Group Conference March 21-23 in Chicago. Image Stream Medical will exhibit at the AORN Global Surgical Conference & Expo March 24-28 in New Orleans. Mr. H, Lorre, Jenn, Dr. Jayne. Get HIStalk updates. Send news or rumors. Apparently the vernal equinox in the northern hemisphere and autumnal equinox in the southern hemisphere are now called the March Equinox since it is the same day. It is the beginning of Spring, although you wouldn’t know it on the east coast this year. The Solstices are when the sun is either highest or lowest in the sky. They are now called the December Solstice and June Solstice for similar reasons as the Equinoxes. So it is the March or Vernal Equinox that you are referring to tomorrow. Not to be overly picky, but isn’t Spring an equinox, and not a solstice? That’s not overly picky at all! (although I’m saying that as an overly picky grammar curmudgeon). Solstice: the exact time (not the day, technically) that the earth is farthest from the sun. Occurs in June and December, the longest and shortest days of the year in the Northern Hemisphere, reversed in the Southern Hemisphere, although it’s the angle/position of the sun and not its distance that causes more darkness. The winter solstice is the first day of winter in the Northern Hemisphere and the sun is at its lowest point at noon of the whole year, which is triply depressing even if you don’t suffer from seasonal affective disorder. You could of course take a trip to the Southern Hemisphere and celebrate that day as the longest rather than the shortest, or maybe use one of those light fixtures (“SAD lamp”) that shoots out pseudo-sunlight, which I’ve done. Equinox: the earth is closest to the sun. Occurs in March and September, when in theory we (or those of us on the equator, anyway, which is a pretty select group of people in 11 countries) get equal amounts of daylight and dark. Today, as The Druid said above, is the March or Vernal Equinox (the latter would make a spectacular rocker name — call him Vern for short). The December solstice is my favorite because I anticipate the days starting to get longer and can pretend that winter is sort of over, but since January and February winter weather can be depressing, the Vernal Equinox gives me the most energy. I’m spending my own money to go to HLTH. I go to JP Morgan almost every year and HIMSS every couple of years. This year, I chose HLTH instead of HIMSS. JP Morgan is interesting because it isn’t so much an “event” as a mutual agreement by healthcare leaders (across the entire spectrum) to all go to San Francisco for a few days and have meetings that you maybe wouldn’t otherwise take. It’s a truly rare venue in that you can meet with the CEO of a major health system, the business guys of a big Pharma company, and the founder of a startup health app in the same afternoon. You can cover a lot of ground (at a very superficial level) very quickly. It’s just a few days of *pure* networking. The downside of JP Morgan is velvet rope syndrome – without a central ‘event’ (a ballroom, a trade show floor, etc.) it is very much about who you know and who they can introduce you to. You have to plan your time well in advance to be effective. HIMSS is a necessary evil. From my perspective (i.e. for my role/life) it’s overly focused on *hospitals* and *information technology* (I get that’s a feature, not a bug – this was after all the Hospital Management Systems Society). Not every problem in healthcare is going to be solved using software in a hospital. Most of them are probably not. But every year, in rolls HIMSS with big booths from the heavy-iron hospital vendors (Epic, Cerner, Meditech, et. al.) looking to meet with CIOs who are focused on incremental improvements to ancient and inadequate systems. All of the “education” sessions at HIMSS are some combination of hopelessly in the weeds and a veiled pitch for a piece of software that I don’t really want to buy. I really don’t need to sit in some nosebleed seats to hear Peyton Manning or Magic Johnson tell me something about health care. The best part of HIMSS is the Mos Eisley Cantina that is the basement or adjunct hall where HISTalk usually camps out. In those 10×10 booths are the dreamers and builders who might really be the next big thing. HIMSS has to exist; real work does get done there – but it’s really pretty deep in the machinery of the health care system. Will HLTH be different? I don’t know, but I’m willing to give it a shot. What appeals to me is that they’re pulling people from all across the healthcare world together to talk about innovation (or dare I say, disruption). They’re bringing everybody from Pharma to big health systems, to payers and startups into one place to think about the issues. I hope that it’s a little bit JP Morgan-ish (maybe with a little bit lower title wattage), with a curated program that mixes people up a little bit. A lot of people who I’ve worked with in the past, and others whose work I respect quite a lot will be there, so I’ll give it a try. I’m paying for it myself. I’m not really convinced that my employer will get any direct value out of it, so I’m not asking them to foot the bill. It’s Vegas – my flight and hotel are covered on rewards points, so I’m out only the conference fee. It’s short money to spend a few days with people you like working together on or thinking about a problem set that you care a lot about. I hope it’s fun.